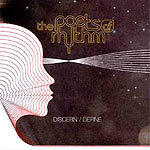 Retro-modernist funk movement pioneers, Munich's Poets of Rhythm, recorded their classic debut album in 1993. The sound that they created could have easily come from the Southside of Chicago in the late 60's, or Memphis in the height of the Stax era. The debut disc Practice What You Preach influenced contemporaries like DJ Shadow and Cut Chemist. The 2001 album Discern/Define is now newly re-issued by Quannum Projects.